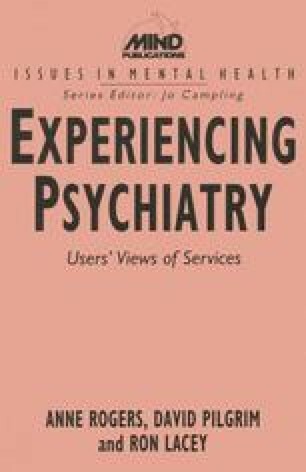 In this chapter we look at people’s experience of psychiatric treatment. Under British mental health law the term medical treatment includes ‘nursing, and also includes care, habilitation and rehabilitation under medical supervision’ (Section 145(1), Mental Health Act 1983). This legal definition of treatment reflects and underlines the pre-eminence of the medical model and the medical profession in mental health services. Here we limit the use of the term ‘treatment’ to describe people’s experiences of interventions that are specifically directed toward the control of symptoms, such as drugs, ECT, and various ‘talking treatments’. Our data suggest that these treatments are experienced by patients as a fixed part the daily routine of services, rather than regimes tailored to people’s individual needs or preferences. Most patients appear to have received most of the available treatments (in particular, drugs) for most of the time. Thus, whether diagnosed as suffering from schizophrenia or from depression, a majority (56.4 per cent) reported receiving anti-psychotic medication, anti-depressants and minor tranquillisers concurrently. Of those who received antipsychotic drugs, more than half (51.9 per cent) received them as depot injections and in tablet or tot form concurrently.